Garnier Nutrisse Ultra Color Nourishing Hair Color Creme dramatically transforms naturally dark hair with ultra reflective tones. Choose from Ultra Light Blondes, Ultra Intense Reds and Burgundies, Ultra Lightening Browns, and Ultra Reflective Blacks. Ultra Light Blondes take dark brunettes to blonde without bleach, Ultra Intense Reds and Ultra Intense Burgundies offer vibrant red tones for darker hair, Ultra Lightening Browns lift dark hair up to three shades lighter without the brassiness, and Ultra Reflective Blacks transform even the darkest hair with visibly reflective, shiny tones. Garnier Nutrisse Ultra Color Nourishing Hair Color Creme comes with an ampoule of grapeseed oil to start nourishing hair while you color because nourished hair means better color. The non-drip hair color formula spreads easily and the after-color conditioner is infused with 3 fruit oils--avocado, olive and shea--for silkier, shinier, more nourished hair. Applying Nutrisse: Nourished Hair means Better Color Garnier Nutrisse Hair Color nourishes while it colors with a rich, non drip creme formula, and with an ampoule of grape seed oil, it smells great while you apply. 3) Apply gloves, squeeze colorant (tube b) into developer bottle (a). See our How-To videos for detailed instructions on how to apply. Rated 5 out of 5 by Purple gal from Amazing color I get so many compliments on this color. The color is so rich and even when it fades (to almost a dusty violet rose) I still get asked if I’ve just dyed my hair. Sadly it’s no longer available at target and marked up almost twice retail price on amazon. Please please don’t discontinue this color. It is amazing. Rated 5 out of 5 by Norsky from Great color I absolutely love this color!! I finally found the perfect shade and now I can't find it in any store. But, I can get it here online, so I'll be shopping. 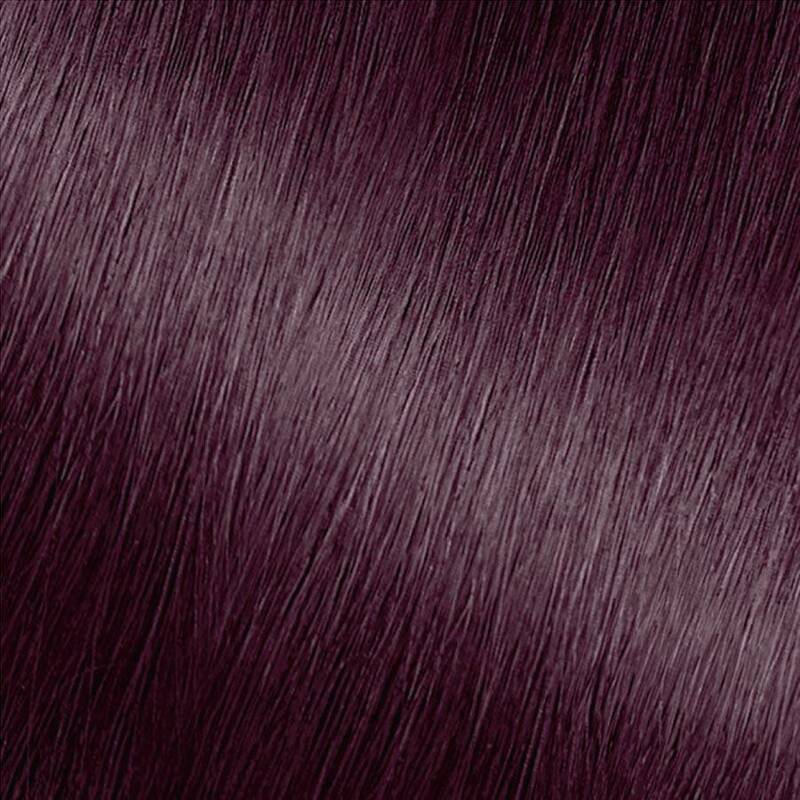 This color covers my grays and dark brown hair perfectly and is the best color I've found to get the perfect shade of purple. Love the reactions I get from people. Rated 5 out of 5 by Evdakatonk from My Grey Hair Loves This Color I'm 61, Asian and have long hair with lots of grey around my face. Got tired of using the typical dark brown hair color, so decided to give this one a go. I love it. Only the grey reflects purple indoors. Outdoors, my black hair has beautiful red highlights. I don't shampoo often, maybe every two or three days, so don't have fading issues. When it does fade, my grey looks like a lighter purple and my grey is already growing out - so time to color again. I like that my hair feels healthy and not dried out or overprocessed. Rated 5 out of 5 by ElizabethD1977 from Love this color! I've been using Sweet Fig for a few months now. I have really thick, long hair, so I always need 2 boxes. I do need to color every 4 weeks, both bc of growth & fading. But I love it! The only issue I have is that my local Walmart no longer stocks it, so I'm concerned it might be going away. That would be tragic! The pics are from Snapchat, but other than the faces, there are no filters applied to modify the color. Rated 3 out of 5 by itsbriwithani from So the color was gorgeous! It was exactly what I wanted. It was cheap, and I should’ve known by the price that it wouldn’t be that great. It washed out so fast, faster than other boxed dyes usually wash out from my hair. I had to redye my hair a couple weeks later. It was the one and only time I’ve used/will use Garnier hair dye. Rated 3 out of 5 by lauraad2b7 from Was super easy to use. My hair feels soft and shines. However I am disappointed in the colour intensity. I picked #526 deep lilac and my hair looks more brown that purple.